Last night our not-so-little guild Combat Wombat tackled a number of dungeons. We put together one group of +40's that ran Caudecus Manor (the second dungeon in the game), and then because we were done so quickly, we ran Twilight Arbor. And because enough people are now in their mid-thirties, we actually had two groups doing Ascalon Catacombs for the first time. At one time I counted 16 people on Vent - which for me, is awesome. It's hard to say how nice it is to be a part of a thriving, fun, like-minded group in the early days of what is sure to be a long-lived, epic MMO. This morning though, the runs sparked a lively and interesting post-dungeon discussion on what exactly people's roles are on a five man dungeon team. Do people even have roles - and if so, how can we fulfill them? One thing I've noticed about Guild Wars 2 is that there is actually a lot more that comes out of Guild Wars 1 than it first appears, and I think one of the things they carried forward is their philosophy towards group roles. 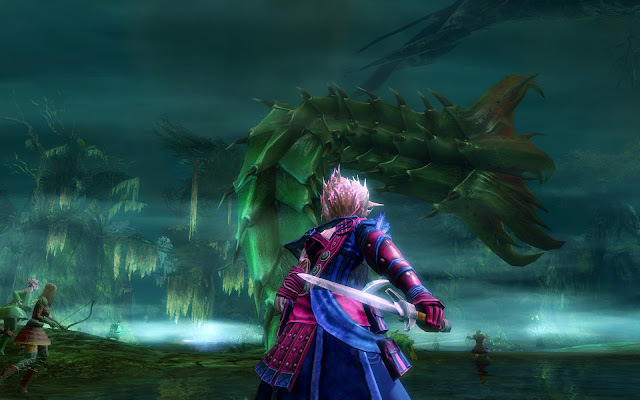 So based on observations from playing the first game, and from what I've experienced in the dungeon runs I've done so far, I wanted to offer up some thoughts on group roles in GW2, intended especially for those that perhaps never played the original game, or only ever dabbled in it, and are coming from a more traditional MMO design like World of Warcraft. This has been a clarion call for ANet's design from the very beginning. They stated over and over again that gone would be the days where you had to get the exact right collection of classes to run a group event. Specific tank, healer, dps trinity is gone, you can go with what you have! But what does this mean, exactly? Does it mean if five dual-dagger thieves show up to run a dungeon, you're good to go? Well to a certain extent, you can. That is, there has been a great deal of thought into GW2's dungeon design. And while things may not go easy, due to the way bosses are layed out, and the placement of waypoints throughout the dungeon, just about all of the most difficult bosses will allow for some degree of graveyard rushing. That is, it's possible in most cases to down a boss simply by making sure at least one person stays in the fight, and every time you are killed you can rez and run back and keep the fight going. So while it may not be pretty, you can in fact progress and succeed in completing the dungeon in exactly such a fashion. For the last two bosses in our first run of Ascalonian Catacombs, this was exactly what our group did. And from what I hear, is how most groups are finishing that dungeon on at least their initial runs. But if you're like me you're thinking this probably isn't what the designer's intended for downing a boss. It's a nice stop gap for learning the dungeon, but what you really want is to down the boss with a minimum of graveyard rushing. And if you want to succeed at that, then you're going to have to take specific roles. And you probably shouldn't all take the same role. When ArenaNet said there was no trinity, what they meant is that the traditional trinity didn't exist. Because there is still a trinity of roles, and there it is: Damage, Control, and Support. This should be your new mantra for creating a team, and should be what you're thinking about when approaching a dungeon. Let's talk a few seconds about each of these roles. Well duh, this one's the easiest, as it's the same as it's ever been. Pour on the damage, burn monsters down as quickly as possible. Control is movement control, and it comes in a huge variety of forms. Traps that snare, frost effects that cool, attacks that stun. In Guild Wars 1, there was never any taunt ability. That's because the notion of aggro control, as you traditionally thought of it, didn't exist. 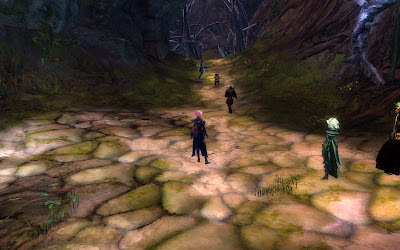 Warriors in Guild Wars 1 didn't taunt mobs. Instead, they were referred to as the front-liners, and their job was to keep the mobs from getting to your back-liners - casters. To do so, you would physically block them, slow them, root them, knock them down, etc. Mobs would try to rush past the warriors up front to get to the squishys in the back, and it was the front-liner's job to make sure they couldn't do that. But it didn't involve taunting. It involved physically preventing the mobs from getting there. This concept is still very much alive and kicking in Guild Wars 2. The job of Control is to is to prevent the mobs from firing their actions through interrupts, which include stuns, dazes, and knockdowns, and to prevent them from moving, with cripples, slows, and knockdowns. Yay healing! Well, yes and no. Healing is, in fact, one of the functions of support, but it is by far away not at all the most important aspect. Because it is every bit as much involved in damage mitigation, and condition control. Damage mitigation is just that, and there are a wide variety of ways to achieve it. From straight up evading, to mitigate your own damage, to abilities that block projectiles and blind opponents, to managing of conditions. And I cannot overstate how important condition and boon management is in Guild Wars 2. 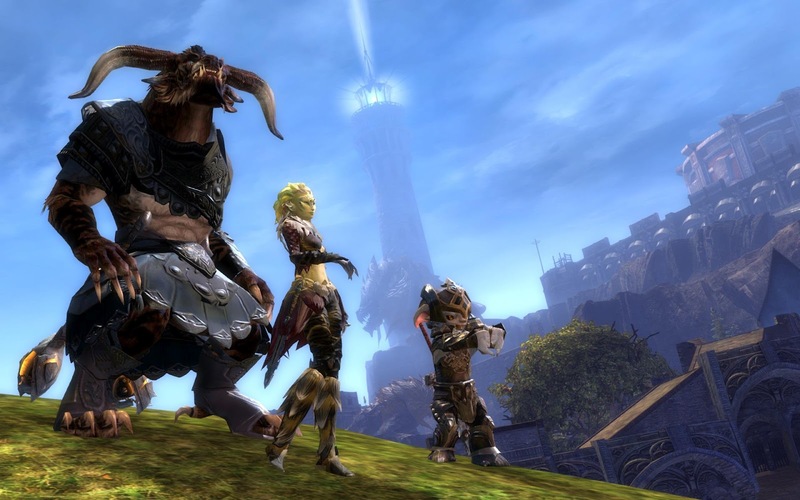 The ArenaNet designers rely heavily on conditions (debuffs), and boons (buffs) as a combat mechanic, and you are expected to react accordingly. So abilities that strip conditions from allies, or remove boons from enemies and places them on allies, or places conditions on enemies - all of those are very important to the support role, and you absolutely must take advantage of them. If you take nothing else out of this post, please take this away. Because it is the one that's the hardest to wrap your head around. I struggle with this one regularly. I think - I'm a thief, my job is to damage. End of story. And I was stunned to learn that yes, there is a quite viable build for thieves to perform in a support role - including healing. So you must break out of the mold of thinking that specific class defines your complete role. Which is to say, while I think you should maintain an attitude of versatility with respect to what role you want to play with your class, you can't stand at the beginning of a dungeon, and completely retool your entire class to take on whatever role you want. Due to the way traits work, you do make decisions about what kind of role you want to take in general, and you will be allocating trait points to better fulfill that role. While you can re-allocate your traits, it's a time-consuming and expensive process. But even within skill point selection and weapon selection, you have quite a bit of variability. So even if you're traited up for dual dagger damage dealing class, that's not to say you can't swap out some skills before you start a run and add some support and/or control abilties. Additionally, to sort of add a caveat to class != role point I tried to make above, some classes are perhaps better suited to certain roles than others. If you start a dungeon run without anyone in plate, it's not to say you can't complete it, because you can. But having someone in heavy armor up front dealing damage and dishing out those control abilities I spoke of before is going to allow for the back-liners to do their jobs, whether it be damage, control, or support. I think the sort of last thing I want to say is to realize that there are definitely some group friendly skills that you should consider when tackling a group. If you're just starting to run dungeons, so far you've most likely built your class around a single function - dealing damage. Perhaps some survivability, but mostly dealing damage. So before you start, take some time to rummage through your skills, and see if there are some things you can pick up. For instance, last night before we started, I picked up Shadow Refuge, and equipped that. It places a spot on the ground that cloaks everyone in stealth, and provides healing over time. It was very useful in the fight. If you're geared specifically around damage, then look at your ability tree and see if there are some things in control and support that you can also bring, that will help the group out. And finally, remember everyone is still new at this. In World of Warcraft, class roles are so strict, and people are so familiar with the game, that a norm has developed of joining a group, and just plugging through the content without talking at all. Ditch that mentality now. Don't be afraid to explain some of your abilities to your group mates, and let them know how you're trying to help. If your aura creates a giant pulsating circle with a house on top, let people know what they can expect by standing in that aura. They may have never seen a healing fountain before, or a projectile dome. Personally, I would rather risk offending someone by explaining something they may already know, than have them not take advantage of the abilities I'm trying to provide simply because they don't recognize the abilities. Much of Guild Wars 2 appears very familiar. But it turns out, the game actually plays quite differently than what you might be used to. And ArenaNet has always taken an attitude (whether you like it or not), of just putting stuff out there and letting the players figure it out. A lot of people are going to try to fit traditional roles and methods (where's my taunt?) onto these mechanics, and they're going to be frustrated when they don't work. Hopefully this will help you take a fresh perspective, and in turn, appreciate the differences, instead of struggling against them. Here's my question. If the boons and conditions are so important to PvE fights (and I agree they are), why have Arenanet made it so hard to see them? Unless I'm missing something, you have to squint at the little icons. And the graveyard zerg might be effective, but it isn't fun to keep dying. Would be more fun to be able to figure out how to avoid it. I've only done the first instance with my guild but what I came away with it from was a feeling that it wasn't really fun and the rewards weren't very good. So on the boons and conditions UI - I couldn't agree more. The tiny little icons down next to your name, and the triple row of cryptic icons under the boss's name aren't nearly sufficient in conveying the kind of information you need to make good choices. I'm guessing they're just relying on you to learn the icons and suss it out. I'm already getting better at tracking that stupid poison icon and it's countdown timer on my thief, because when it appears I need to get that condition removed asap. wrt to your other points, I also agree - especially about grave yard rushing not being fun. But for myself I get through it because I remember so many mission in guild wars 1 as coming across as just friggen complely impossible the first couple of times you attempt them, and then when you finally get the right mix and build and methods, it becomes completely doable. I remind myself these are those same designers, and trust there's a key that will soon be uncovered. I also don't know what they were thinking with Ascalonian catacombs being the first dungeon. The prevailing opinion is (and so far I share this opinon through three dungeons), that is is harder than most of the other dungeons you encounter. It's certainly much harder than Caudecus Manor. Whenever a condition is applied on you, your character says something to inform you what was applied (audio). Kring: If I'm in a guild group in a dungeon we will be using voice chat, I probably won't hear what my character is saying. Even more so if there are lots of noisy spell effects going off all around. I have always played a DPS class in MMO's and in most of them it was pretty straight forward. Last nights run taught me this will not be the case in Guild Wars 2 just like your talking about. From reviving to just making the group better overall there is a lot to watch out for. I felt myself slowly getting into a groove towards the end of catacombs run. I agree. I really love the versatility of my ranger. When I'm alone, in a large group of monsters, after I've shot my volley of arrows I'll often switch to sword/torch and wade in there with the second AoE, then pick them off one by one with the sword. With the ability to jump in and out of the fray with the sword, as well as the AoE and the ranged toss of the torch, I feel like even the melee set of weapons gives me some survivability. Of course, I tried it out in the dungeon last night on the troll, figuring maybe the poison ability would slow down his regen. I promptly got shown the floor and didn't try that again. :D But generally speaking! re: boons, I don't find them hard to see because you don't need to know WHAT they do. Red = bad and cure it asap. You can see all these red icons in the group window, or under your own health smack dab in the middle of the screen at the bottom. Anything yellow is a boon, anything red is a condition. Mesmers get an ability that the more often they are hit = more boons on them, and then you can transfer all of those boons to everyone else. So you just wait until 5-10 yellow icons show up, hit the other skill, and bam, whole group has those. It's much easier for me to see now what those icons mean just through trial and error, the one that roots for example, the daze symbol, etc. I think it matters less what each icon represents, and more just to recognize when you have (or don't have) those icons in general. Another really brief comment to add to Dusty's. Gear DOES make a difference. If you are wearing gear lower than your character level, you WILL notice a difference. Try as hard as you can to keep yourself geared in the best gear you can get for your level. Even when mentored down to 15-25, at level 80 I performed far worse wearing level 70 gear than I did wearing level 80 gear. I also learned to start gearing up stats based on what I do. I'm a plate wearing class. I'm on the front lines almost constantly EVEN if I am playing a support role, I get hit. I've been stocking up on toughness and vitality, because those folks behind me are going to (hopefully) be stocking up on condition and the other bits that will take the mob down while I hold it there. Well said. I believe a certain amount of flexibility with weapons and utility skills goes a long way towards making the dungeon experience more enjoyable. In one of my first AC storymodes, we were wiping on the ghost trash mobs consistently until a thief switched to whatever he was using to apply blind. 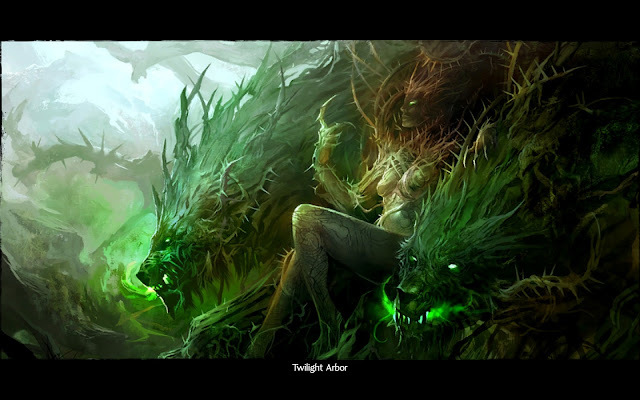 Ditto a Twilight Arbor run with the nightmare hounds that were tearing into us horrifically until we started blinding them consistently too, and making sure everyone had condition removal. As a Guardian, I've been bringing a hammer or mace/shield/focus into dungeons lately, instead of my usual sword/focus solo weapons. If I manage to land that third hit to apply symbol of protection (and a simple trait switch makes symbols larger and symbols heal), I've noticed everyone in melee range becomes a lot safer. I felt rather unprepared for my first AC run, having had the mistaken impression that there was no semblance of the "trinity". Now that I've got a better idea of what the roles are, how they are filled and how they overlap, I'm actually somewhat excited. I loooooooved tanking in WoW. When I stopped playing, I had three 85s, all tank-spec. 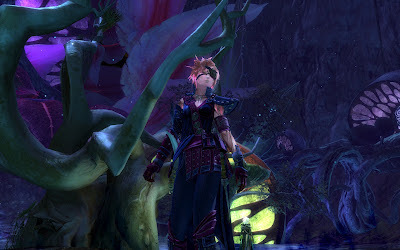 It seems like most of what I liked about tanking in WoW is covered by "control" in GW2. I still need to make some mental adjustments, but in so doing, there will be much, much more to try out than there ever would have been with the old trinity. Control-spec thief? Control-spec squishie? I'm very intrigued. I'm still going to park my thief for the time being to level my warrior, but I am liking the future possibilities. Excellent points, Dusty. I definitely got the sense that, to what extent you're able given the traits you have, you do need to switch out your abilities when going into a dungeon or other large group thing. As an aside on that note, I wish they'd give us the ability to save sets of skills for different situations. It's nice, too, that you CAN be more than just whatever your profession is generally pigeon-holed into, and I think we will find that everyone, even if they intended to go in as the dumb faceless dps or whatever, needs to step up and wear different hats as the situation calls for it. "I wish they'd give us the ability to save sets of skills for different situations." I meant to mention this earlier in the post, but got distracted. Though this is strictly speculation on my part, I have to believe ANet will provide such functionality before very long. They had the ability to save, load, and even share build templates directly from within game in GW1, and I would be very surprised if they don't add similar functionality for entire skill selections once the rest of the game settles down a bit. We Will Not Go Quietly..